This little outdoor table is guaranteed to deliver good times! Two sided 12" game board panel has Tic-Tac-Toe on one side and a chalkboard on the reverse side. This Happy Game Table is handcrafted from solid wood. 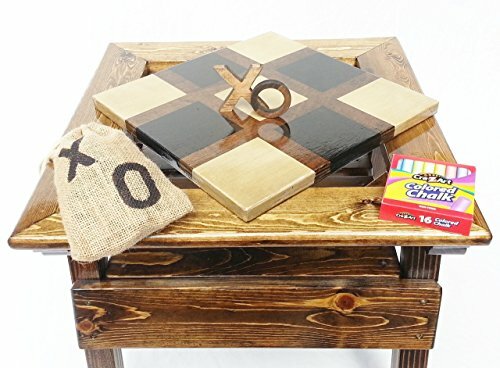 Included is a set of folk art Tic Tac Toe playing pieces, sturdy, wooden, handcrafted, easy grip X's and O's (also known as Hugs and Kisses) for years of play and enjoyment. Also included is a starter chalk set. The table also features a shelf to hold books or treasure and burlap bags to store the playing pieces. This custom Happy Game Table is pampered beginning with the first stick of wood. Handcrafted no two are alike. We use some recycled wood and you may find a small ding here or there but the minor imperfections are part of their story. Due to the nature of the wood and the handcrafted details, each one varies slightly in beauty. Each piece is varnished with two coats of marine finish to protect your investment. The chalkboard side of the table is not varnished and not rated for outside use. If you have any questions about this product by Happy Chairs and More, contact us by completing and submitting the form below. If you are looking for a specif part number, please include it with your message.